As part of our after care service, we have set up a ‘Web pal’ programme for all of our candidates here in the UK. 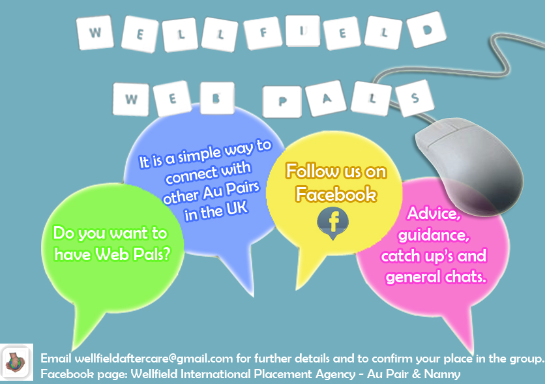 It is a group set up by Wellfield staff where you are able to build on-line friendships with other au pairs. As you are aware, we also hold candidate meetings every six weeks which gives you the opportunity to meet up with the friends you have made on-line. To confirm your place on the web pal programme please email wellfieldaftercare@gmail.com confirming you would like to be added to a group. Please see the attached leaflet for more details, the groups will be via email and on Facebook.